Probably the number one reason your dog loves an artificial lawn is that it feels so good, and it is not only dogs that appreciate the lush and comfortable feeling of artificial grass. Artificial fibres are designed to bounce back no matter how much your dog runs and jumps and rolls. A properly-installed fake lawn can't be dug up by bored pooches - and who wants to dig up a lawn that is so much fun to play on anyway? You hate it when your dog leaves messy footprints all over the house, and he hates getting yelled at for rolling in the mud. Install a synthetic lawn and you can say goodbye to mud and mess forever. A good drainage system will ensure your lawn never gets waterlogged and muck is a thing of the past. This means your happy hound can play to his heart's content, whatever the weather. Do you ever bother to read the list of ingredients on that box of fertiliser? Unless you keep it completely organic, your living lawn is likely to be treated with a few nasty chemicals that can leach into the water supply and cause problems for wildlife. Your low-care lawn does not need anything more than the occasional wash and brush up - or even hoover! Another bonus for dogs - and humans - is the lack of pollens that can irritate and cause allergies for both us and our canine companions. Happy hounds love to lounge on artificial grass, so why not get creative and design a dedicated dog run? This is a great way to let your dog enjoy his outdoor time in total security, giving you peace of mind knowing they are both entertained and enclosed. Fake grass is the ideal choice for all the reasons listed above; in addition, it makes your dog feel great about rolling and romping. Why not deck out his outdoor dog house with an artificial turf lounging mat for a happy hound? Perhaps this should be the number one reason why dog's love artificial grass - because you love it. After all, it saves you time and effort, creates a beautiful centrepiece for your garden, and is better for the environment because it is less resource hungry. Whatever you love, your faithful hound will always give a big paws-up to! Of course, you don't need to own a dog to get an artificial lawn - cats love it just as much. 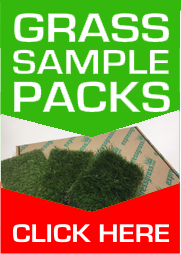 Installing fake grass is easy to do, so why not browse our website for the best grass for your garden?